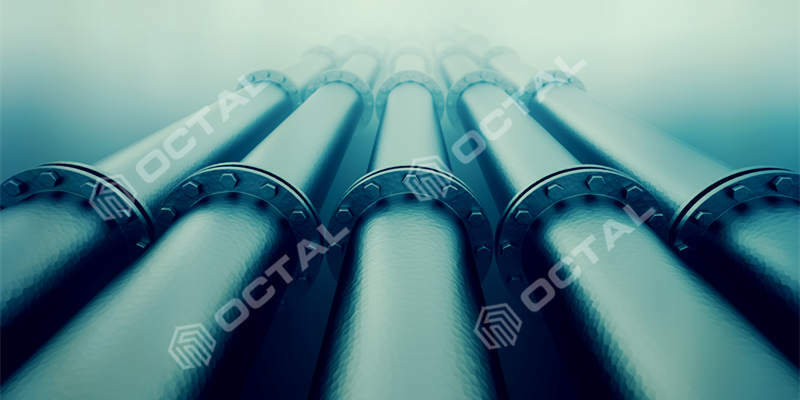 Always in pipeline systems we met the material with NACE MR0175/ISO 15156 pipe or fittings, so do you really know what is the major differences between NACE carbon pipe and normal carbon steel pipe? And how is the cost for nace material? NACE was established since 1943, full name is The National Association of Corrosion Engineers. The founders were 11 engineers of anti-corrosion of pipeline industry. Till now, NACE has been the largest organization to broadcast knowledge of anti-corrosion and improve skills of corrosion prevention. In NACE standards, MR0175 is the standard of material requirements for H2S containing oil and gas production and equipment. As a result, Nace pipe is used in H2S containing gas and oil transportation. You could find NACE MR0175 standard specification from here. NACE MR0175/ISO 15156 provides common rules, gives suggestions and requirements to select qualified steel materials, that served in equipment used in oil and gas production, and in natural gas sweentening plants in H2S-containing environments. Where if such equipment failed could make a risk to human health and safety, and damage to the environment. It is also a federal standard in US as recognized as ISO 15156, for Petroleum and natural gas industries that materials applied in H2S-containing environments in oil and gas production. This standard NACE MR0175/ISO 15156 addresses all mechanisms of cracking that can be caused by H2S, including below cracking conditions. Steel materials that selected or qualified using NACE MR0175/ISO 15156 are resistant to cracking in defined H2S-Containing environments in oil and gas production, but are not nesessarily immune under all service conditions. We know that there are a lot of equipment applied with NACE MR0175/ISO 15156 standard, mostly in oil and gas drilling, construction, lifting activities. Sour water handling equipment, natural gas treatment plants. And most important, steel pipe and fittings that for transportation pipelines of oil and gas, liquids, and multiphase fluids. This is something we are going to talk about. In standard NACE MR0175 carbon steel pipes and fittings material used in petroleum industry usually contain carbon less than 0.8%. 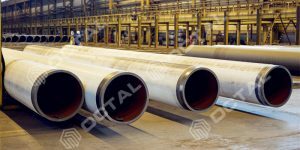 Carbon and low alloy steels includes plate, pipe, pipe fitting that complied with NACE MR0175, with stated exceptions, further SSC testing is not required. Nevertheless, any SSC testing that forms part of a materials manufacturing specification shall be carried out successfully and the results reported. Please note, the carbon and alloy steel pipes and fittings described/listed in previously NACE MR0175 (all versions) were identified by extensive correlations of filed failures/successes and laboratory data. The hardness limit of HRC 22 applied to most carbon and low alloy steels was based upon correlations of heat treatment, chemical composition, hardness and failure experience. The higher hardness limits for the chromium-molybdenum steels were based upon similar considerations. NACE MR0175 standard includes below standard steel pipes. Steel pipe and related fittings which are made from the NACE material (complied with NACE MR 0175 or ISO 15156 standard). We call them NACE pipe, or NACE pipe fittings. Therefore, these products are specially used in the oil and gas environments that contain the H2S etc corrosive chemicals. 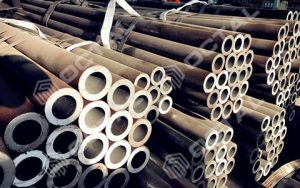 For carbon and alloy steel pipes, NACE MR0175 has limits for content Sulfur (S ≤ 0.002%), Phosphorus (P ≤ 0.020%) and Carbon (C ≤ 0.10%). Mechanical properties of tensile strength, and yield strength is same with general pipes referred to corresponding standards. For sour service steel pipe, plate, fittings, commonly there are two test methods referred NACE. HIC and SSC. HIC is Hydrogen Induced Cracking. HIC test is a mandatory test for NACE pipe and fittings. But if there is certificate to proof the material (Raw material for making pipes or fittings) comply to NACE MR0175, then there is no need to do this test again. SSC is Sulfide Stress Cracking. SSC test is a long time lasting experiment. The test is specially to alloy steel, to put test material in corrosion environment plus with constant pulling force (Under situation of working force and metal inside force). In these two factors (Corrosion + Force) affects, material havs the brittle rupture. So this is SSC cracking. The material shall be used in water-containing liquid and media which include all kinds of gas, or H2S containing crude oil, the H2S absolute partial pressure ≥0.0003 Mpa (0.05 psia). a. 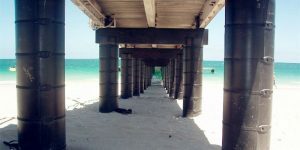 Low pressure gas: the total pressure is lower than 0.4 MPa (65 psia). b. Low pressure gas and oil multi phases media: the total pressure is lower than 1.83 MPa. MR0175 standards of general material requirements for selecting of cracking-resistant material, cracking-resistant carbon and low-alloys steels, cast irons, cracking-resistant alloys and other alloys. And details requirements for H2S containing equipment. 1) Subjected by chemical ingredients, hot treatment and micro structural etc. Influences metallurgy conditions and strength. 3) H2S partial pressure, that is H2S concentration and the overall absolute pressure ratio. Pipe corrosion speed also influenced by cold working of metal. Although steel pipes, pipe fittings, production and equipment meets the standard NACE MR 0175, have the function of anti-H2S corrosion. But in case unsuitable design, manufacturing, installation, material’s choosing and processing etc, all these factor could leading corrosion-resistant materials to sensitivity. The price for NACE pipe itself is not too much higher than general steel pipe, (Especially for API 5L pipe or ASTM A106 pipe, the price is higher but not more than 100 dollars). On the other hand, the hard and expensive part is HIC and SSC test fees. If the quantity is very less, and there is no stock available, it is almost impossible to get this material. 1) Resulting in equipment cannot work as usual under pressure. 2) Could not make sure to bear the pressure of the system. 3) Lead to equipment basic function cannot sustain. But under usual or low pressure. To choose the NACE material in these working conditions: such as water treatment equipment, sucker rods and liquid pump etc. All these products have detailed specifications, but not belong NACE MR0175 standards scope. The responsibility of users is to make sure whether the standards is suitable for the work conditions. The materials of NACE steel pipe and fittings that included by this standards could be used for any given parts. From manufacturers side, their responsibility is to make sure the specified material satisfied requirements of metallurgy, while the users’ responsibility is to make sure selecting the right material for the environments. Users could select by working condition (include pressure, temperature, causticity and characteristics of liquid etc.,)to choose specific material.